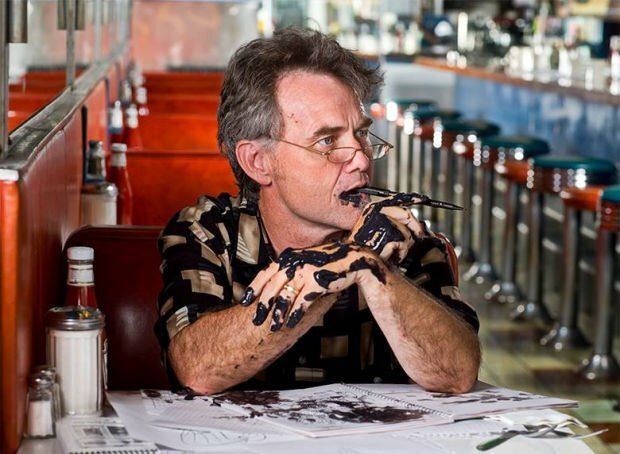 My fondest memory of attending the 2013 American Association of Editorial Cartoonists conference in Salt Lake City was hanging with fellow cartoonist Steve Benson, the Arizona Republic’s inkslinger. My wife and I, and a clutch of other truant ink assassins that included Steve had sneaked away to enjoy a liquid lunch downtown. Treasured and framed, our Benson original hangs in a place of high honor in our home, between an Oliphant charcoal of Uncle Sam and an original “Doonesbury” by Garry Trudeau. Steve belongs among the masters of the ungentlemanly art. On Wednesday, Steve Benson was among the journalists laid off by Gannett. Steve started skewering targets at the Arizona Republic back in 1980. Thirty-nine years and 10,000 cartoons later, he’s gone. The nationwide layoffs came amid reports of a hostile takeover bid from Digital First Media, a monolithic hedge fund subsidiary that is slashing its way to being the largest publisher of hollowed-out newspapers in the United States. When I started in ’86, Benson enjoyed well-deserved national acclaim. As the years have passed my respect and admiration for Steve has only grown. The grandson of Mormon church president Ezra Taft Benson pulled no punches when it came to criticizing his fellow Mormon in the Governor’s seat, Mecham. Eventually Steve renounced Mormonism, became a vocal evangelist for free thought, and was shunned by his faith community for it. At this point, I felt the tone and targets of his cartoons changed for the better. Steve won the Pulitzer for editorial cartooning in 1993. By then it was clear. Try fencin’ with Benson and you’ll lose. These days Benson is one of the most brutal critics of President Trump. Forgive me. My tense is wrong. Benson was one of the most brutal critics of President Trump, until he was sent packing. Newspaper cartoonists are often tasked with drawing up retirement cards for departing employees. After 39 years one can only guess how many “Goodbye and Good Luck Cards” Steve Benson has drawn for souls departing the Arizona Republic. I’d be honored to draw your involuntary retirement card, Steve. I’d draw you with the Arizona sun smiling down on you because I know you love the West. Then I’d draw you standing tall with a sword that resembles a pen, in one hand, and the U.S. Constitution, as your shield, in the other. I like to save the face, the fun part, for last. Mop of unruly hair. A disarming smile that says don’t take it personally. And the squinting good-humored eyes that could make you feel bad guys were in the crosshairs of a professional. All it took was one cartoon to hit the bull’s-eye. A fearless evangelist for democracy, and for social and economic justice, Steve Benson’s peerless line work was confident, his renderings beautiful, his color lush, and his compositions striking. A joy for this cartoonist to behold. Steve’s concepts were consistently powerful, provocative and memorable. And his cartoon likenesses of Rose Mofford with a towering coif, and Joe Arpaio as a bilious gasbag with a nose the size of Eloy were definitive. No senator or sheriff was safe when Benson dipped his nib in his inkwell. Now, north of the Gila, the bad guys are a little bit safer. Steve leaves a legacy that is unmatched. For evidence I refer you to the thousands of Steve’s cartoons, carefully torn from the editorial pages of the Arizona Republic by readers, that are enshrined on refrigerators in homes, haciendas and trailers all across this wonderful state. For a cartoonist, there can be no greater tribute. Unless, like me, you count hate mail as a badge of honor, a tribute to the strength of your work. To all of the thousands who wrote letters to the editor calling for Steve Benson’s head you finally got your wish. It only took four decades.